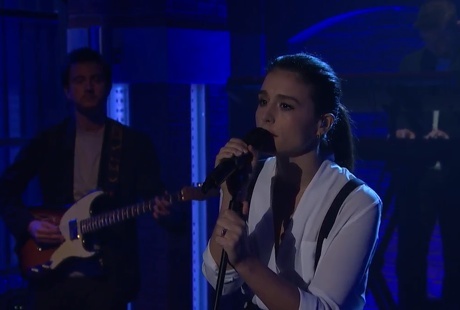 British songstress Jessie Ware released her sophomore record Tough Love just last week and she stopped by the Late Night with Seth Meyers studio last night (October 29) to perform her latest single "Say You Love Me." Keeping it simple and soulful, Ware delivered the heart-wrenching ballad to an obviously impressed studio audience. Tough Love is available now through PMR/Island, and you can watch her belt it out on Meyers' show below. Read our recent interview with Ware here. Jessie Ware Shares New Single "Adore You"
Jessie Ware Returns with "Overtime"
Jessie Ware Details 'Glasshouse' LP, Shares "Alone"